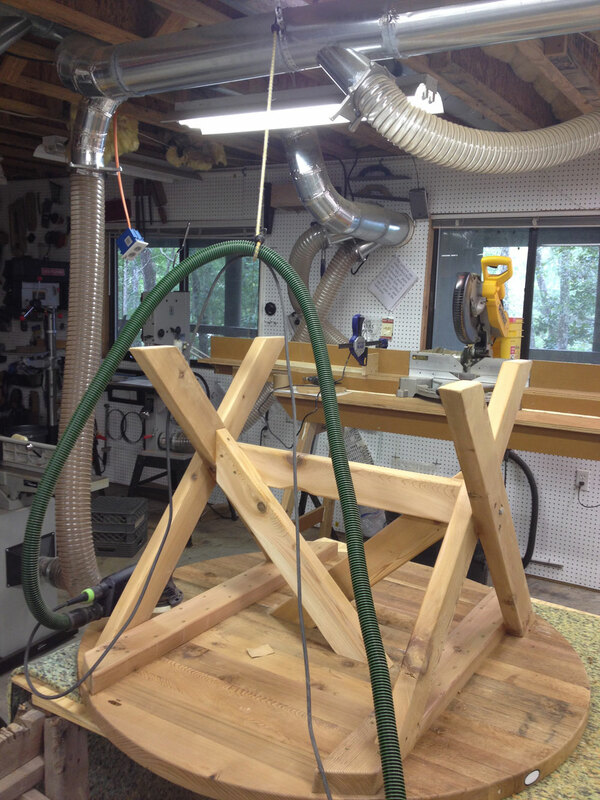 We’ve previously discussed an inexpensive way to keep one’s dust extractor hose and power cord above the project, allowing maximum versatility. 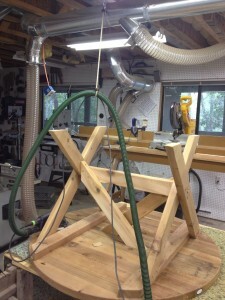 Here is the first generation of do-it-yourself overhead Festool dust extractor hose management. Of course, if you’re not a do-it-yourselfer, Festool makes the Festool Boom Arm ready-made to perform this function for you. Now, Festool has come out with a new system that encloses the hose and cord in a cloth wrap that will prevent the hose from marring your workpiece. You can order one by clicking here, and choosing the “Anti-Static – Sleeved with Power Cord type” in the options. 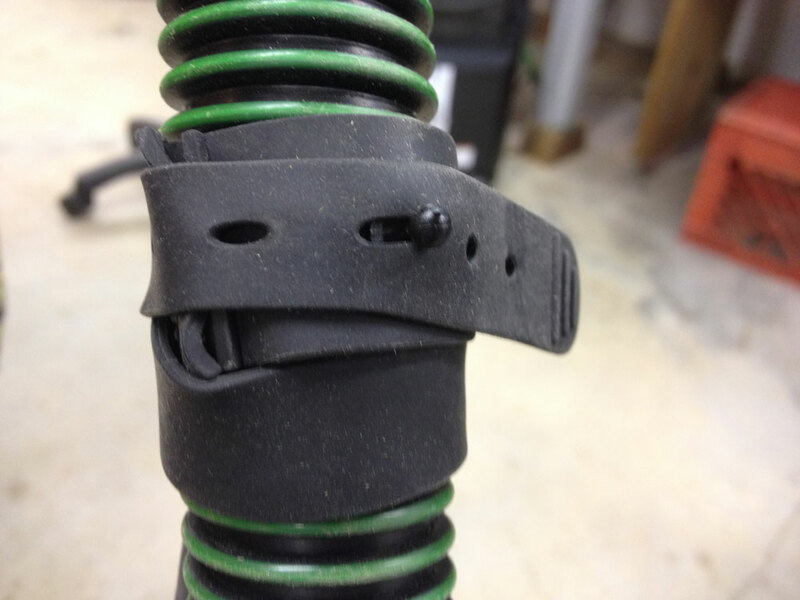 Here’s my El Cheapo version: Use Velcro straps to tie Festool sander power cords to Festool vacuum hoses as they travel together to the Festool dust extractor. The generously-long cords of Festool tools make this part easy. 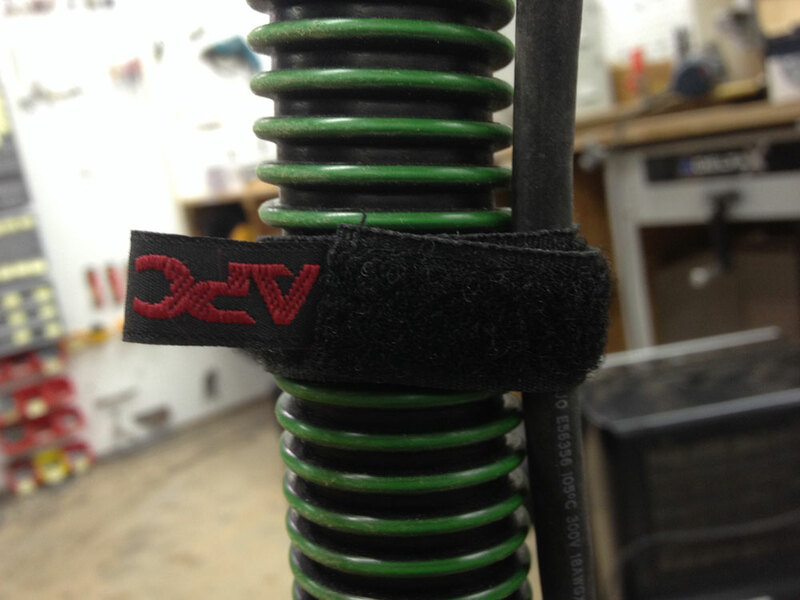 I had a bunch of these Velcro cord wraps, with little use for them until I stole this idea from Festool. Most of them came from uninterrupted power supply (UPS) units that power our computers when the electricity is off. Alternatively, there is a rubber version of cord wraps that works just as well. I looked for a small-diameter drainpipe sock that could serve as a cover, but was unsuccessful. Darn! 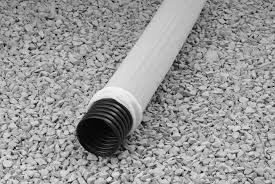 Just in case you don’t know what a drainpipe sock is, feast your eyes. You have to hand it to those Festool designers: they come up with some great ideas! I had not realized (read the fine print) that you are from south Mississippi. I live in South Louisiana and frequent the Mississippi Gulf Coast regularly. It is great to see another southern woodworker making a mark. I too have fallen under the Festool spell. This tip has spurred me to make a hanging hose system myself. Thanks. I have to say that I have enjoyed your postings with Highland for some time. Please keep up the good work. I am part of a growing woodworkers club ( The Baton Rouge Woodworkers). Perhaps we could have you to speak at one of our monthly meetings if you have the time to make the trip. Looking forward to what you present in the future. Thank you for your kind and generous words, Ray. While I would love to come and meet you and your group, time constraints rule. Meanwhile, I hope to continue to be a blessing to our fellow man and woman through writing. Encouragement like yours really helps. You are a Barnabas to me. thanks for sharing ,I like it .